-The Felix Circle Experience- Since late 2004 an experimental sitters circle for Séance-Room Phenomena, Physical Mediumship and Spirit Contact near Frankfurt/Germany, the Felix Circle, is active and involved in highly sophisticated experimentation and group healing activities. Inspired by the work of others and supported through findings of a new generation of open holistically thinking scientists the circle steps weekly across the borderline of our reality...! Dear Friends, again we present today pictures from Brazilian Materialisation Experiments, that are not so well known under European Researchers. The captions being used are the originals of the specific publications where the pics once were published and do not represent the opinions of the authors of this bolg! Enjoy! 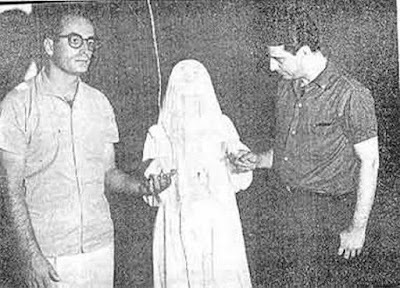 Photography that shows the medium Antônio Alves Feitosa, supplier of the ectoplasma, with the spirit materialized directly behind him(Sister Josepha). On his right side Francisco Cândido Xavieir, another brazilian Medium is standing. This photography was done by Nedyr Mendes da Rochas in the year of 1965, in Uberaba, MG, using a camera WING marks Roleiflex and movie Kodacolor of 100. The development of the materialized figure was done in darkness, this photo was done by photo-flash. It is interesting to notice the ectoplasma coming out of the mouth of the medium, like if it were clothes, "falling" downwards to the ground. This materialisation was achieved through a "joined" mediumistic approach, and when this photography was done, a third medium, Otília Diogo, was seated inside the cabin. 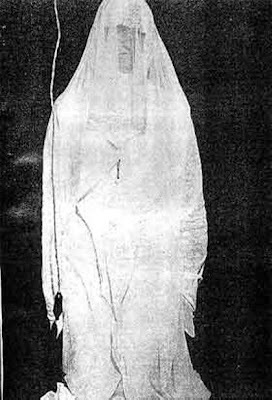 Sister Josefa materialized in the city of Andradas, through Otília Diogo. The face of the entity is in no way identical with the face of the medium. This phenomenon also happened in a session arranged for local reporters. The completed and now autonomous acting materialized form of Sister Josefa with her bulky and complicated clothes. The marvellous entity is hugging Francisco Cândido Xavier and Wanda Marlene. 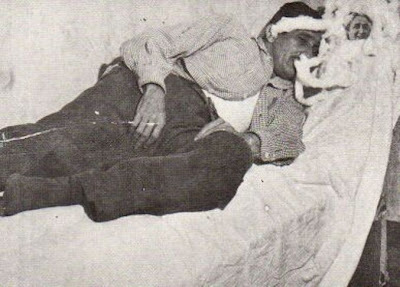 The photo, of Nedyr Mendes da Rochas was made in front of a group of attending medics. 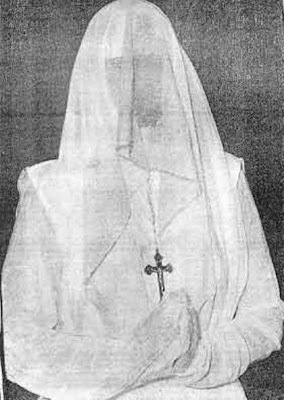 Notable photography of the materialisation of Sister Josefa, in Uberaba. Sometimes, during seances, sitters are able to witness, when her face undergoes various "modifications". 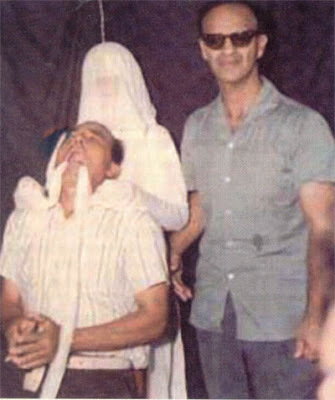 Waldo Scallop and the reporter José Franco being touched by Sister Josefa in the famous experimentation of the 3rd of January 1964. 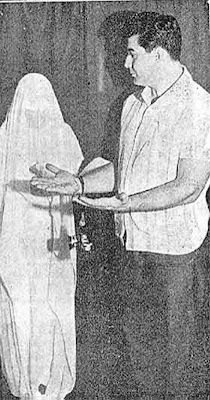 The reporter Jorge Audi with Josefa posing beside him. Like José Franco, Audi had attitude of humility and deep respect when the materialização saw. 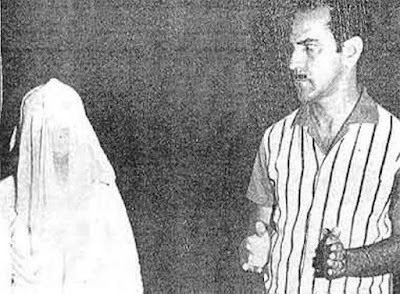 The famous photography of the reporter Mário de Moraes beside the materialisation of a medical Doctor Alberto Veloso, discussing issues concerning the healing procedures following. 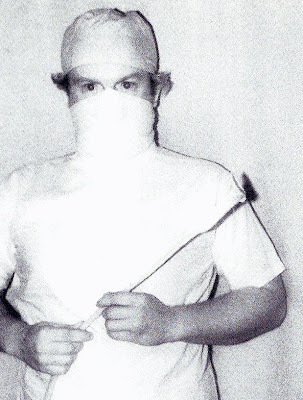 (Photo of Nedyr Mendes da Rochas) Total Materialisation of Alberto Veloso, who was a surgeon working with Dr. Waldo Vieira, before he died. Here we see a Materialisation Experiment from the Eighties with the medium Ivam Feirreira Castro in the Santuario de Frei Luiz. 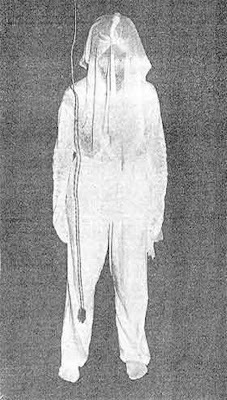 And this is, what he materialises, the full form of a German doctor called "Friedrich Stein", who immediattely began to treat several sitters inside of the Seance Room. 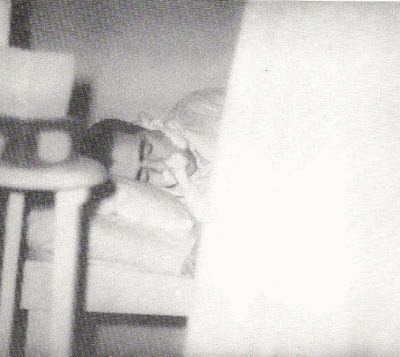 Materialisation of the spirit "Ana", in 14/12/1953, where the medium Peixotinho can be seen in ordeal (sic) laid on the bed. This medium carried out experiments at the home of Francisco Cândido Xavier allowing, through his faculty, in the main close friends of the sitters to materialise. Another materialisation carried out by the medium Peixotinho. the peculiar face of the form was identified by sitters as a close friend, died during a car accident. 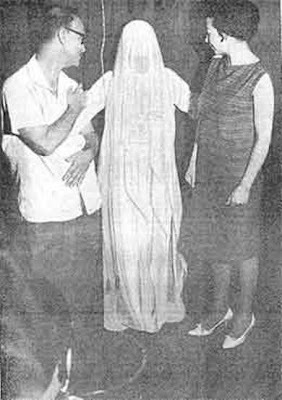 Process of extruding ectoplasm for a partial materialisation of the spirit of Lady Maria Gonçalves Duarte, who in life had been the wife of the spiritualistic Portuguese speaker, Isidoro Duarte Santos. We hope you have enjoyed our little tour through the times and spaces of international Physical Mediumship. Upcoming there are peculiar other very seldom published images of international Physical Mediums through the centuries! the sake of defending those that do." Are you earnestly interested in rare mediumistic phenomena? Are you a scholar of the mysteries of mankind? Join the Felix Circle Experience! - our connected Youtube-Channel 'TvBeYond'! ONLY A FEW MORE DAYS TO THE SPIRIT SUMMIT 2019! SUBSCRIBE NOW HERE! ARE YOU AFFECTED BY NEGATIVE ENERGIES? Interdisciplinary Clearings help you! The human nature is tightly interwoven with Powers we today do only know very little about. Again and again people with a sensitive cognitive system, or in crisis, or after certain spiritual techniques may feel affected by negative spiritual powers. Their intrusion is always made possible by reasons many originating in the here and now and beyond! We help to analyse and get rid of nearly all forms of etherical or psycho-energetic occupancy and utilize therefore a row of interdisciplinary faculties. The Genuine Suisse Psychokinetic Medium "Silvio"
The Medium 'Kai' was as a child very ill and had first memory of then leaving his body to converse with etheric entities for the first time. With eleven a strong Poltergeist case in a friends family caused a strange initiation-like experience feeling connected with the physical phenomena. Like possessed he started to read into parapsychology, reincarnation, occultism, hypnosis and spiritualism, founded his first sitters circle with 15! From the start he always triggered physical phenomena. Parallely he learned hypnosis, deep meditation and different kinds of non-common consciousness-states. He consulted RSPK-victims, experimented with ITC, Trance- and Physical Mediumship and Clearing-Methods. End of 2004 his mediumistic mission became clear. Sophisticated mediumistic experimentation and healing-activities. Paraphysical phenomena were regularly produced for intl. guests and scientists. Keine Abmahnung ohne vorherigen Kontakt ! Sollte der Inhalt oder die Aufmachung dieser Internetseiten gesetzliche Bestimmungen od. fremde Rechte Dritter verletzen, so bitten wir um entsprechende Benachrichtigung ohne Kostennote. Wir garantieren, dass die zu Recht beanstandeten Passagen unverzüglich entfernt werden, ohne dass von Ihrer Seite die Einschaltung eines Rechtsbeistandes erforderlich ist. Dennoch von Ihnen ohne vorherige Kontaktaufnahme ausgelöste Kosten werden wir vollumfänglich zurückweisen und gegebenenfalls Gegenklage wegen Verletzung vorgenannter Erklärung einreichen. Haftungsausschluß: die Inhalte dieses Webprojektes wurden sorgfältig geprüft und nach bestem Wissen erstellt. Aber für die hier dargebotenen Informationen wird kein Anspruch auf Vollständigkeit, Aktualität, Qualität und Richtigkeit erhoben. Es kann keine Verantwortung für Schäden übernommen werden, die durch das Vertrauen auf die Inhalte dieser Webseiten oder deren Gebrauch entstehen. Hiermit distanzieren wir uns ausdrücklich vom Inhalt und der Gestaltung aller verlinkten Seiten. Für den Inhalt der verlinkten Seiten sind auschl. Deren Betreiber verantwortlich. Gem. § 28 BDSG widersprechen wir jeder kommerziellen Verwendung und Weitergabe unserer Daten.